​Heritage Medical Associates has developed a culture of caring, friendly, quality healthcare professionals since 1991. Now, they are the largest independent multi-specialty physician's group in Middle Tennessee with more than 100 physicians and 10 specialties in addition to primary care. 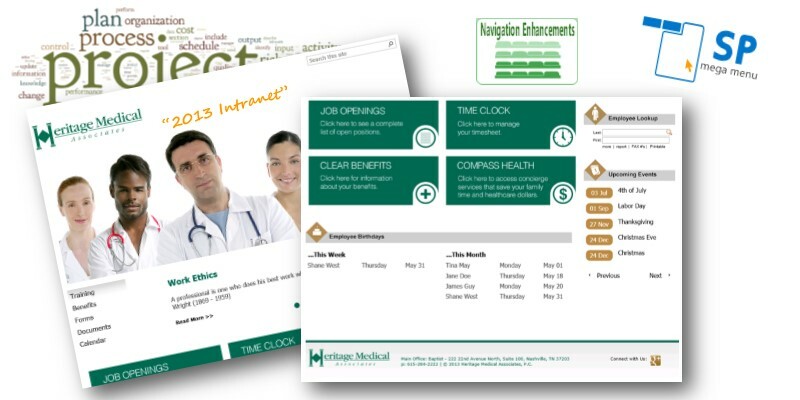 Heritage Medical Associates contacted us with specific needs for branding a SharePoint 2013 farm to match their corporate messaging and marketing style. It was a sophisticated composition that looked nothing like SharePoint and yet leveraged several SharePoint features for calendars, announcements, and other lists. We approached this development by standing up a VM on our network with a web app for Heritage and starting their branding there. Working collaboratively with the client we were able to start the design on our end. When we felt it was close, we transferred it to their farm so they could interact with it more easily. A couple of minor third-party web parts filled in colored calendars and of course the last 20% took 80% of the time. After production was launched we were engaged to build a dev farm and provide managed services. This proved to be needed, as soon as a service pack or update corrupted their production search capability and we stood up the dev farm as the production farm. Later we wiped out the production farm, rebuilt it, and then transferred the data back to it as it had more robust resources. Heritage's intranet has improved communication and collaboration, and also now possesses that hard to measure the quality of increasing morale amongst staff. We are one of the oldest providers of Microsoft SharePoint consulting services, and one of the easiest ways to get to know us is with a SharePoint health check, so contact us today!